Treliska Guest House © Travel Signposts..
St. Ives offers a good range of hotels, guest houses and B&Bs and for our stay in this town we wanted a place that was in the town centre. Treliska’s website was one of the few that caught my attention and it gave good vibes. The breakfast menu looked unreal for a guest house and, being coffee addicts, the final hook for us was the “fresh bean to cup coffee”. From our experience, the descriptions of many B&Bs and guest houses on the internet are frequently much rosier than what the places are really like. So when we arrived at the Treliska, there was a little bit of trepidation as to what the lodging would be like. As we were working, we didn’t want a place that felt like hardship. Treliska is owned and operated by Gill and Mike. Gill was out shopping when we arrived and Mike welcomed us to the place. Within five minutes of chatting to Mike, we felt totally at home at Treliska. We had been on the road travelling around the U.K. for a month and stayed at Radissons, Marriotts and all manner of hotels, and only at the Treliska did we experience a truely friendly welcome. We stayed for three nights in Room 5 in September. The room is on the second floor and as there is no lift, lugging our heavy cases up the flights of steps was an effort. Of course, not many people arrive in St. Ives with 20 kg. cases like we did! If, like us, your trip to St. Ives includes travelling with a large case, see if you can get a room on the lower floor. Room 5 is small but so well laid out, and the space put to such good use, that everything that you need for a short stay is there. The toilet was okay for me but a tall or bigger person would find it a bit fitting. There are only 6 rooms at the Treliska so if you’re planning to stay here, book early and see if you can secure the bigger room. The breakfast was magnificent and every bit as good as shown on Treliska’s website. There is a choice of quality yoghurt and the fruit salad, freshly made, is one of the best that I’d enjoyed on our entire trip. There is also a great choice of cooked breakfast, including dishes for vegetarians, and they are all cooked to order. We complimented Mike on the generous breakfast. Although we don’t eat eggs and bacon or huge breakfasts, I personally dislike places where you are made to feel that there is food rationing. Mike and Gill are very generous hosts and with their wealth of information we also got good tips from them as to what to see and where to go. Treliska is just behind the harbour and ideally located near shops and restaurants. Parking space is a premium in St. Ives and Treliska doesn’t have its own on-site parking. 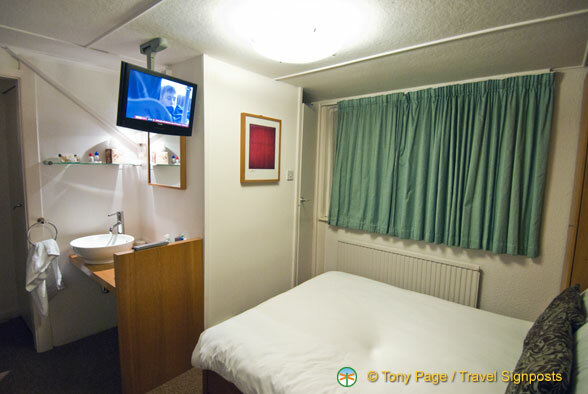 If you’re driving, it’s worthwhile paying £6 per night to have an allocated space reserved at the train station – this is arranged through Treliska. St Ives is a very popular destination in summer and even the huge car park at the train station was full every day that we were there. In the guest lounge there is a computer for guest use and the rooms are WiFi connected as well. In summary, Treliska is a good value guest house in an excellent location in central St Ives and you couldn’t ask for better hosts than Mike and Gill. What We Liked: The friendliness of Mike and Gill, the magnificent and generous breakfast, free Wi-Fi and guest house location. What We Didn’t Like: No on-site parking, but this is typical in St. Ives.